Just now I extracted the partition alone from a VHD to a file, mounted it on ImDisk, and successfully applied the Vista install WIM on it. I hadn't even corrected the sectors before. Rules out something wrong with this particular ISO/WIM. Then now you have to re-do it the same (with the same ISO/WIM) to the same image mounted with an offset from within the vhd. Is this the same ISO/WIM that failed originally? How big is size is this test image (the volume) you are currently experimenting the apply with? How big in size was the one that failed originally? You initially reported about a dynamic VMDK, you are now talking of a VHD (static, dynamic, what)? Maybe is the "dynamic" nature of the container that caused the issue? Personally (JFYI) I would not even THINK of using a "dynamic" VHD or VMDK, IMHO a disk or volume image should always be RAW (though of course using a sparse file for it is OK). Yeah it's the same ISO/WIM. So this is the original situation itself. I redid it again and it hung at 58%. VMDK was my original situation (stalled at 10/11%), then I tried with static VHD (immediately after I discovered the problem, stalled at 72%; just now, stalled at 58%). So it's not just dynamic. Now we know that DISM doesn't have a problem with superfloppy images, it's obvious that ImDisk is exposing some difference in the mounted partition of the HDD image, as compared to the superfloppy image. At least you have not specified if in all cases you set IMDISK to expose the "same" kind of device. 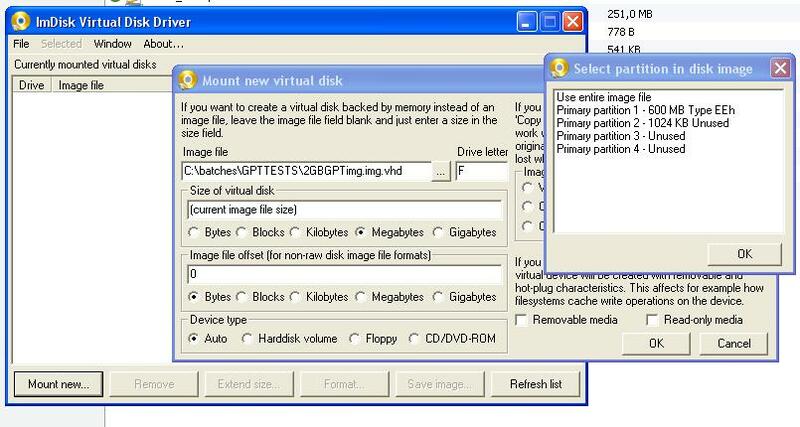 With a "superfloppy" image the "Auto" should correspond to "Floppy" , whilst with a partition it should correspond to "hardisk volume". Logically, since the small image worked in both ways, the different behaviour must be *somehow* connected to either the "full size" of the image or to some peculiarity of the "real" .wim. You tried with a "minimal" image (like 20 Mb or so) which worked BOTH when "superfloppy" AND when "volume on hard disk" and with a "full sized" partition (that failed) and later with another "full sized" superfloppy (which succeeded). If we put size of the images in a scale of 1 to 100, we know that "size 1" works in both ways and "size 100" works only as "superfloppy" (at least this is what you reported). It would make sense to try a "size 25" and a "size 75" image to see if there is any connection with the size. Maybe you can delete a number of files from the volume to which you applied the .wim and re-capture it (thys making a smaller .wim) to try applying it to a smaller image (it doesn't matter if the result will be bootable or not, here we are just troubleshooting the applying process). with the one and the other images and see if you can spot any difference in the way they are enumerated in the OS. Ah sorry, I should have been more careful. I was operating on a 10GB VHD (and earlier VMDK of same size). It created a 32MB partition before automatically, I did not go to change that. The rest went to the partition I have been experimenting on, of size 1039036144 bytes. The smaller one was 30MB in size. Maybe I should try deleting the 1st partition? Hardlinks could have posed a problem, as you said, though I can't imagine how. Also just confirming, ImDisk counts partitions from 1 right? I am not sure to understand the question. But yes the entries are 1/2/3/4 AFAICR. IMDISK control panel when you attempt mounting a volume should prompt you with a list of the volumes found, and you choose one. dd one of them to a "superfloppy"
Ohh, now maybe here is a potential problem vector : I am using ImDisk Toolkit which has a partition selection GUI field to select. I'm quite happy for it, since I hate entering offsets by hand. Anyway that is why I asked to confirm. The field is a "spinner", one where you can click up or the down arrow button to increment/decrement the partition number. It's starts from 0, hence the slight (1%) doubt. Well, then you need to try again, using the IMDISK control panel directly for the tests (or use command line). The IMDISK toolkit is a nice addon but it might introduce (in perfect good faith and to the scope of easening the user experience) any kind of "different" behaviour. Partition entries are traditionally numbered from 0 (in the DOS/windows world) but from 1 in the Linux world, and more or less any tool/connection uses the one or the other, there is no really "fxed" rule for it, AFAIK. table and 5-8 to mount a partition from an extended partition table. I just wanted to show that I follow the policy of Olof... In fact, the partition number in my GUI is directly transmitted to the command line tools (imdisk.exe or DiscUtilsDevio.exe). That said, I can understand your annoyance if the one you are trying to help does not use the same tool. Moreover, I just found a bug for an image file created with Arsenal Image Mounter, on which I created 2 partitions: my GUI is able to mount the second partition but not the first one. There is not any "annoyance" , just trying to get to the root of the issue, and find (if any) the actual culprit of this strange DISM behaviour. Our friend milindsmart (very understandably BTW, as he is mostly driven by enthusiasm, which is a very good thing ) is not (yet ) used to be very exact in his reports, and thus I have to apply some mild torture in order to extract from him the info. Of course, if by any chance it will come out that the issue is connected with the use of your toolkit, I will be the first one to propose a mild form of punition for you, I guess crucifixion would probably do . I don't have followed everything, but it would be surprising that a DISM issue could be related to what I found. The volume is properly mounted, or it is not mounted at all. - an issue with the partition number set to 0 (for mounting the whole image file): DiscUtilsDevio handles it, but not imdisk.exe, and I forgot to check this case. This should be easy to fix, with no side effect. I think you will have to wait for the crucifixion. Edit: the first bug has another consequence: .nrg and .sdi files cannot be mounted. Edited by v77, 12 September 2014 - 05:15 PM. OR, I can remove the last sector which would make the VHD a RAW HDD image, but I HATE that virtually every tool I tried is going to copy the WHOLE file and save it as a different filename, then deleting the original one, instead of just simply LINKING that cluster to a different filename record! Please save me guys, any tool that stops worrying about fragmentation and avoids wastefully moving around GBs of data even when I'm trying remove 1 SECTOR? Edit: by the way, I just upload a new version of ImDisk Toolkit with fixes for the bugs I was talking previously. And about the interface of which Wonko was talking, you also can get it with the "Switch to Driver Interface" button of the mounting tool. In case of a multi-partition raw file, this will show the list of the partitions of which he was also talking. Edited by v77, 13 September 2014 - 02:27 PM. HxD also took ages to save it when I moved 100MB of sectors. HxD works well when modifying without changing the length, but apparently is not smart enough for this. Yeah I realized that only a RAW HDD image would allow ImDisk to show a list of partitions. I am using a fixed size VHD, which is a RAW image plus 1 sector. But when I used the driver interface, it showed the size as 2TB, with no prompt for partition. Look, there is something that simply does not sound right. Maybe I am using an older version of IMDISK, but here it works fine. A plain, standard, "static" VHD is a RAW image with one sector appended to it. IMDISK (the plain, normal,. standard control panel app) should access a Standard VHD EXACTLY as if it was a RAW image since it will simply IGNORE the appended "Conectix sector". Try changing the file name from .vhd to .img. <- I doubt that anyone may have included the extension into some form of autodetection of the file format, but you never know. IF it still doesn't work, simply open the VHD image in *any* hex/disk editor and fill the last sector with 00's. <- to all effects this will become a RAW hard disk image with an "excess" sector after the partitioned space. By *any* I mean here Tiny Hexer (or other hex editors that have an option to open an image file as "disk") . Just now I had another case of failure unwittingly : Arsenal Mounter resulted in the same problem with the same VMDK. I did not even expect it, I actually wanted to test something else on it. I used the option to "mount through discutils". And I think I MAY have got the answer here : I have been using GPT, not MBR. Could that have not been implemented in ImDisk's autodetection, but implemented in DiscUtils, and having some bug. Sorry guys, I should have given this info earlier, but you would have if any of you tried replicating at any point : we could have debugged bit by bit. Yes, ImDisk does not handle GPT. I just tested a static multi-partitioned VHD file in MBR: the mounting tool (at least the last version) is working fine, and using "Switch to Driver Interface" shows the list of partitions inside the image. I also tried to use GPT for this image file: it works with DiscUtils (so, with the mounting tool of ImDisk Toolkit), but you have to add 1 to the partition number, because the disk manager of Windows creates a hidden partition of 128 MB for each GPT disk. Edited by v77, 13 September 2014 - 04:42 PM. I am using plain IMDISK. Under XP SP2 (I know). It opens fine GPT disk images (of course it sees ONLY the protective MBR 0xEE partition entry), BOTH as RAW images AND as "static" VHD's. No IMDISK toolkit, no discutils, no .Net (madness ) involved. Does not work for me. The ImDisk control panel shows no list of partition for a static vhd partitioned with GPT. I only get an automatic offset of 1 block. Actually it lists also a MBR partition entry with ID set to 00. I have never got any list at all! Using 1.8.4. How come? I have latest IMDISK version under Win7SP1. A static vhd is a raw image with one extra sector which many mounting tools will ignore or at least it wont stop these tools to mount the static image as a raw image. ImDisk will popup a list if your image (MBR for sure, GPT not according to my experience) has multiple partitions.